I’m Alessandra Fusi, hopeless dreamer and freelance illustrator. I live near Rome with my thousand pencils and my six cats. 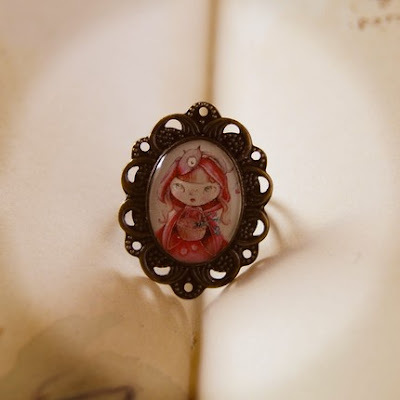 Here is a vintage romantic ring with a print of my painting “Little Red Riding Hood” (see pictures). The subject is printed on high quality artistic photo paper, set in an antique bronze filigree cameo setting and protected with crystal resin. The whole size of the ring decoration is 30x23mm. This bookmark is off-set printed on fine art watercolour paper, so the colours are strong and vivid and they will not fade. 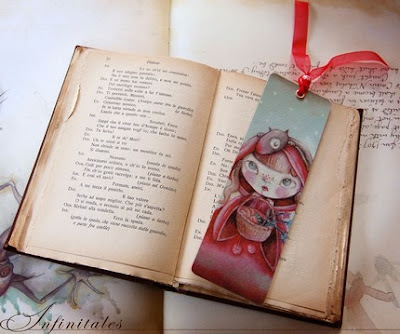 Each bookmark is laminated to make it glossy and water(or coffee, or tea!)resistant. Back of bookmark is hand signed by me and feautures a lovely texture. Size is approximatively 5,7 x 17,8 cm (7 x 2 1/4″) (without ribbon), with round corners. So cute! I love the ring. Oh my goodness! That ring is amazing. I would love to win that! +2 My favorite item is the I’m Late Locket. So cute! her work is so lovely!! I love her work… please pick me up!!! I love her butterfly pendant with the print of LRRH. So wonderful!!!! She is an amazing artist and sweet lady! I retweeted her giveaway on twitter and I am linking to it on my blog. Best of luck to everyone. Ihope I win!! Alessandra prompted me to participate, because I have longed for that ring for quite some time already! Your dreamy work spins me round in fantasy! My favorite would have to be this locket – I’m Late – http://www.etsy.com/view_listing.php?listing_id=24541110. I adore fairy tales and Alice in Wonderland the most! What lovely things. Great stuff! Ooh, my favorite item is the sleepy hedgehog print! These are my favorite so far prize wise. +3 I’m Manderiffic on Twitter! +5 I’m a blog follower! +3 I became a fan on Facebook and shared the contest with my friends! +5 and I added the button to my blog. +2 My favorite item is The Growth-Winter Time print. +1 I think that they are adorable!! Leave us your name and email address +1 contact me through blogger. Oh, would I love to win that! 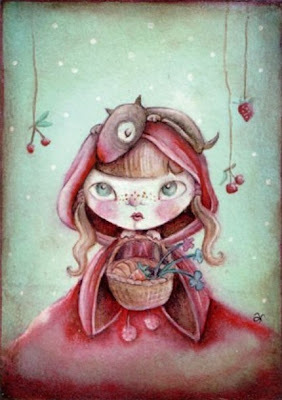 My name means Little Red Riding Hood, so it would be a great addition to my collection! +5 I follow your blog. +3 I follow you on Twitter (@pippirose77). +2 I hearted her shop. I’d like to enter if it’s open internationally. I love Alessandra’s work, thanks for the chance to win! +2 Love the Tea for Two print. +2 I love Locket – A small seed! Hi there, please enter me into this contest!